Hi HIH! It’s been a minute! How is everyone’s 2019 kicking off? Well, I hope! If you haven’t been living under a rock for the last week or so, you’ll have seen people posting photos of themselves in 2009 compared to a present-day selfie: behold, the 10 Year Challenge. From celebrities, to brands, to maybe even your mom – everyone’s jumping on board with this latest social media fad. Is it just a simple way to show how people and the world has changed over the last decade, or is there more to it? Let’s dive into the possibilities why this 10 Year Challenge (also known as “the glow-up challenge”, 2009 vs. 2019”, and “How Hard Did Aging Hit You”) is taking social media by storm. So, what exactly is the 10 Year Challenge? As mentioned above, it’s the first massive viral fad to emerge on social media this year. It involves posting a photo of oneself from 2009 compared to a recently taken photo. At the time of this writing, the hashtag #10YearChallenge has amassed over 3.4 million posts on Instagram. Is It: A Facebook Conspiracy? Creepy, right?! But think about it: it wouldn’t be the first time that our data is being collected through Facebook for uses unknown to us. Take for example last year’s Cambridge Analytica-Facebook scandal, wherein 50 million Facebook profiles were shared with Cambridge Analytica thanks to a Facebook-administered psychological ‘quiz’, were then analyzed for specific data, and that data was then provided to the Republican party and was used in Trump’s presidential campaign. (Which could mean that phenomenal #NastyWoman Hillary could potentially be in-office at this very moment if the Republicans hadn’t quite literally cheated the system). Is It: A Selfie Opp? Unlike past viral social media movements that were established to raise awareness for a cause (ie. 2014’s Ice Bucket Challenge aimed to raise awareness for ALS), the Ten Year Challenge doesn’t seem to have any force driving it besides being an excuse to show your followers your glow-up journey from ‘09 ‘til now. Which is totally fine – who doesn’t love a little self-validation every now and then? Is It: Just A Meme? And then, in true internet fashion, this “challenge” has also been turned into a dumb meme mocking the entire #TenYearChallenge movement. There have been various instances of accounts posting mockeries of their ten year transformations. 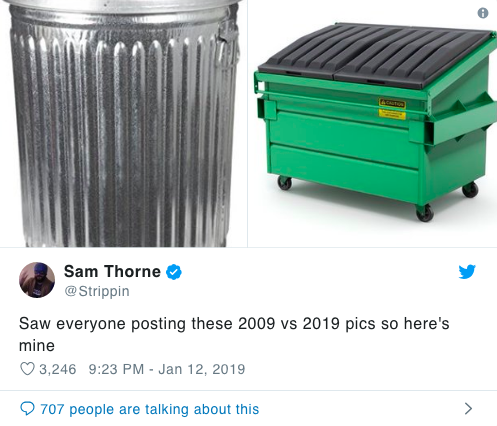 For example, a 2009 “selfie” of a trash can vs. a 2019 “selfie” of a slightly different trash can. Cute, guys. So, what’s the verdict: data collection conspiracy, opportunity to show your growth over the past decade, or just a goofy meme? And the question also begs: have you or are you going to participate? Ashley - Facebook has always had our older photos, so I really don’t think that this “challenge” is a catalyst to help them create facial recognition software. Whether they started the challenge or not, they’ve always had to data (our photos) to be able to do this. So, I definitely think just vanity project. When you think about the demographics of whose participating in the challenge (typically anyone 18-40) there’s a very good chance that almost anyone would look dramatically better in their 2019 picture. Facebook just gave people the opportunity to show their 10 year “glow-up” - I mean, who wouldn’t want to show everyone how much better they look now? Ellie - I agree with what Ashley mentioned. Facebook conspiracy seems paranoid and unnecessary, while the shift to Instagram marks the phenomenon as a trend people are willing to remove from the platform of origin to claim for their own personal brands/online identities. It feels, just as Ashley mentioned, like a "vanity project". However, vanity doesn't need to be a bad thing. I think it's so appealing because it's an exercise in self-presentation. "What did I look like 10 years ago? What did I stand for? What did my style communicate and do I still stand with those values?" In affirmation through negation, a sense of identity is formed and communicated through these images. Riley - I think Ashley is spot on by calling it a “vanity project” — I don’t believe it adds value except to visualize how much older, more mature, more “beautiful” people participating in the challenge believe themselves to be after an entire decade. That said, of course people have come a long way in the span of 10 years. That’s inevitable — it’s TIME. But the most profound “Before/After” combinations I’ve seen have not been about people’s faces or bodies or hair — it’s been the huge changes in the environment, in society, and in politics that people have shared (e.g, images of the coral reef ten years ago and today — SHOCKING and DEVASTATING). I think an added element of value to this project would not be just “wow this is what I looked like when I was 12 vs 22” but rather, the things one has learned, experienced, and reflected on that stand out most in that time period. For example, it would be really cool and valuable to me to see how much I thought I knew then, versus what I realize I STILL DON’T KNOW now and yet have come to understand since I was a kid. Make sense? Let us know what you think, us at Serotina want to know!